Bernie Sanders has decided to give peace a chance. On NBC’s Today show, Sanders was asked if he believes Hillary Clinton is qualified to be president, despite his recent claims to the contrary. “She’s qualified?” Savannah Guthrie asked, again. On Wednesday, Hillary Clinton was asked if Bernie Sanders was qualified for the presidency. She declined to answer, but argued that the senator hadn’t “done his homework” on the core issues of his campaign. She also accused him of betraying the victims of Sandy Hook with his position on gun manufacturers’ liability. Sanders responded by essentially shouting, “I’m not qualified? You’re not qualified! That whole damn system is not qualified,” at a rally in Philadelphia. 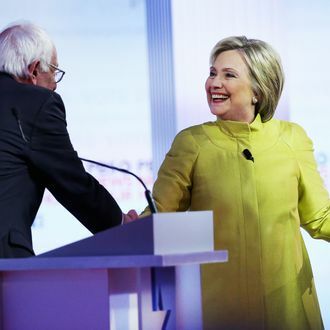 On Thursday, Clinton extended an olive branch to Sanders, by reiterating that she would prefer the Vermont senator over the pseudo-fascist demagogue and far-right theocrat who are leading the Republican primary race.